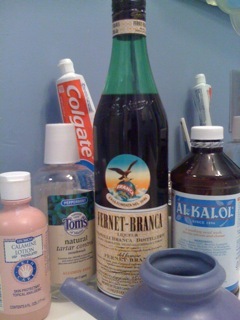 I can't decide if Fernet Branca is a liquor or a mouthwash. FIRST, YOU NEED TO KNOW that Fernet Branca is one of the scariest liquids I’ve put in my mouth in a long, long time; second, that it is a liqueur highly regarded by the cocktail community. Describing Fernet Branca as medicinal and herbal with notes of eucalyptus and mint is a serious understatement; that would be like describing gasoline fumes as earthy and peppery. Think camphor meets green Nyquil. Or, have you ever used Alkalol? Alkalol is a “natural formula” brown menthol liquid that you snort into your sinuses, which both cleanses them of pollen and burns all the flesh off of your nasal passages. Alkalol and Fernet Branca: separated at birth? If I haven’t scared you away yet, then on to the cocktails! With much trepidation, I poured our first drink: Fernet Branca and Coca-Cola, wildly popular in Argentina. The responses from the elite panel of judges: Dad says it tastes like Vicks VapoRub meets birch beer. Leah says, “I wouldn’t dump it out,” but I notice she doesn’t drink any more of it, and later, she dumps it out. I like the bitter finish, but I simply can’t stomach the menthol edge. Take two. I mix Fernet Branca with something bolder than Coke: Finger Lakes Distilling’s McKenzie rye whiskey. The resulting drink, the Toronto, is a classic reminiscent of an Old Fashioned, but with an invigorating smack in the nostrils and a bitter finish. 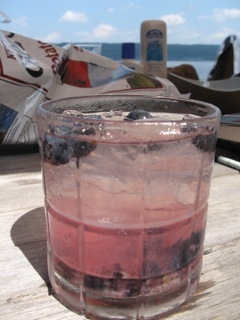 The three of us agree we can almost appreciate this cocktail. Supposedly, Fernet Branca is an acquired taste that develops only with regular drinking. Stay tuned: We’ll revisit this one in a second column and see if the Fernet Branca lands on the bar beside the Campari, or on the bathroom counter next to the neti pot. Pour all ingredients over ice. Stir for twenty seconds. Garnish with a twist of orange peel.